Naresh is Chief Growth Officer of Husys Consulting Limited, the first HR Company to be listed on National Stock Exchange in India. He started his professional career at Husys after earning his Masters in Business Administration, eventually heading the India operations in 14 years. He guided more than 1,500 companies in 15 different industries in driving the HR Function Management concept. His deep understanding of business functions in these industries, coupled with expertise in emerging technologies helped him to build Husys as one of the best HR Cloud platforms. He mentors every associate at Husys to drive excellence in client experience. 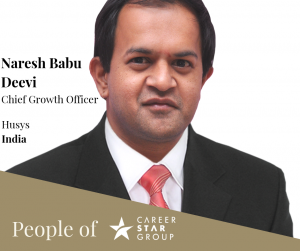 He handled the first ever largest Outplacement in India based at Bangalore.